Delve into a mythical land forged by fire and ice. Our epic journey through lush lava fields and the windswept landscapes of Iceland begins in the quirky capital of Reykjavik. Spend time exploring Iceland's Viking heritage and admire the beautiful natural backdrop, before meeting your Travel Director and fellow travellers for a Welcome Reception. This morning, we cross the vast expanse of Eldhraun, the largest mass of lava ever to flow on the face of the earth, before reaching Skaftafell National Park. See the largest glacier in Iceland, the Vatnajökull, before continuing to Jökulsárlón Glacial Lagoon, for magnificent views of the ice cap and drifting icebergs that melt into obscurity in the lake's waters. This afternoon, 'Dive Into Culture' at the Thorbergur Centre, where you'll learn about one of Iceland's most famous 20th-century writers over cake, and coffee or tea. Later, we travel to Höfn, the lobster capital of Iceland. The mystical landscapes of Almannaskard Pass provide a spectacular backdrop for our leisurely journey along the majestic southern coast of Iceland. We continue to the East Fjords with their towering mountains that plunge dramatically into the Norwegian Sea. Tonight, we stay on the shores of Lake Lagarfljot, in Iceland's biggest forest. Explore the vast moonscape of Mödrudalsöræfi, a highland desert plateau which astronauts once used as a practice ground for their voyage to the moon. Then journey to Dettifoss, Europe's most powerful waterfall, before continuing towards Námaskard Pass with its colourful bubbling mud pools. See the natural beauty of Lake Myvatn and the twisted Dimmuborgir rock pillars, chimneys and towers that rise from the surrounding lava landscape. We journey north to the bustling port of Akureyri with its fine timber buildings beautifully restored to their original glory, stopping en route at Godafoss Waterfall. Spend the day in the fishing town of Siglufjördur, nestled within a dramatic fjord on the very edge of Iceland's steep northern mountains. Explore the town at your leisure or consider a whale watching excursion for a chance to see these majestic creatures up close. Amble along the harbour lined with colourful façades or visit one of the local art galleries before returning to Akureyri in the afternoon for some time at leisure. Enjoy dinner this evening at your hotel. Majestic mountains and narrow passes lead to Skagafjördur, renowned for its horse breeding traditions. Here, we'll 'Connect With Locals' over a Be My Guest lunch on a local horse farm. Learn about the unique Icelandic horse breed and watch a short riding demonstration, before journeying to Borgarnes, our home for the night. Connect with the geological wonders of Snæfellsnes and admire its lava fields, volcanoes, glacier, springs, beautifully formed rock, and yellow and black sand beaches. The main attraction is Snæfellsjökull glacier, a beautifully shaped stratovolcano at the very end of the peninsula. The glacier is also known as the location for Jules Verne's novel 'Journey to the Centre of the Earth'. 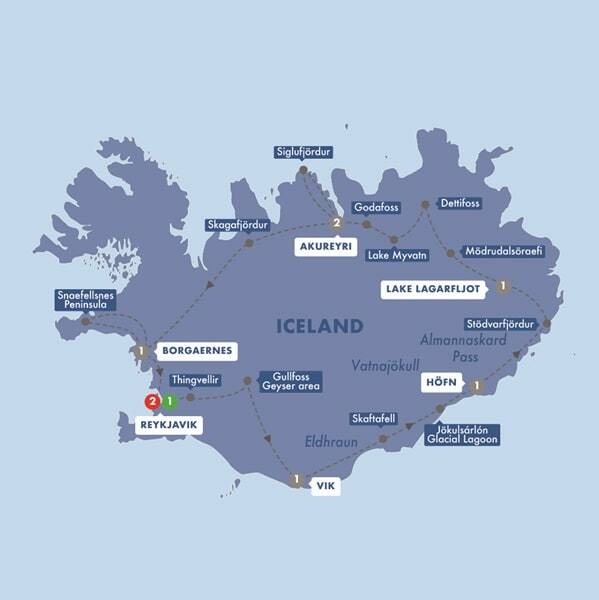 This afternoon, complete your circuit around Iceland as you arrive back in Reykjavik. Explore the small capital city of Reykjavik on a sightseeing tour this morning. See all the city's major attractions including the Parliament, the harbour, the Harpa Concert Hall, and see the city's main landmark, the Hallgrímskirkja Church perched at the top of a hill in the heart of the city. 'Dive Into Culture' at the world-famous Blue Lagoon (please remember to pack your swimwear) - its steaming turquoise waters are said to have healing powers. This evening we reminisce over the myths and legends we've encountered along the way, during a Farewell Dinner with newfound friends and your Travel Director. For now it's time to say a fond farewell to Iceland after an unforgettable trip. Transfers are provided to Reykjavik airport. Conditions apply.